With Arnold, you can be confident of a reliable product with accurate fit, design, material, and construction. In addition to reliable parts and accessories, Arnolds easy-to-follow instructions and extra tips will ease your equipment maintenance and assure that you get the job done right. Arnold belts are designed and tested to meet performance standards. Tbook.com crawls the web to find the best prices and availability on Lawn-Boy and related Tools and Hardware products like Arnold Toro and Lawn-Boy Replacement Wheel Drive Belt for 24 inch and 26 inch 2-Stage Snow Throwers. For this page, related items include products we find that match the following keywords: "Lawn-Boy" at our vendor partner Home Depot. 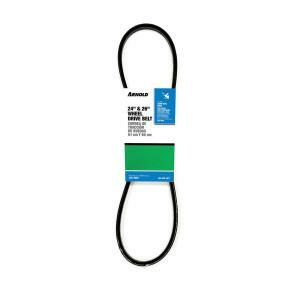 Arnold Toro and Lawn-Boy Replacement Wheel Drive Belt for 24 inch and 26 inch 2-Stage Snow Throwers is one of 16 Lawn-Boy and related products listed in the Tools and Hardware section of Tbook.com If you have any questions on this product, please give us a call at 734-971-1210 during the hours of 9am - 5pm EST for assistance. Thank you for shopping at Tbook.com, the Internet Department Store!